We were fortunate to have a free day today after swimming lessons were cancelled due to less than 70 degree weather (in July!) Reagan came across her tea set that she hasn’t played with for awhile and asked if we could play tea party! Sure! 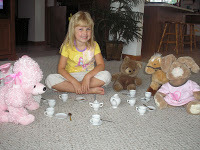 She got 5 of her “stuffed” friends and we sat down for a tea party. Reagan was a gracious host taking care of each of her guests, offering tea, cream, sugar, cakes an d brownies. 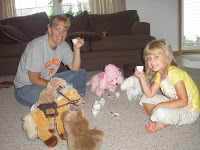 We had a fun time around our tea party. I am grateful for the cancellation today and the little moments like this!